Just like The Art of Brian Bolland before, this book is packed with great art. These two books represent a lifetime of work that's quite awe-inspiring. The difference here is, it collects only cover art, those specifically from DC Comics. No Judge Dredd, for example. There are some unavoidable repeating content, but it's minor stuff like cover art that's printed small here but big there, vice versa. Brian Bolland has a lot of covers and at 208 pages for this book, it's not possible to include everything. Half of the book has cover art printed full page. The other half consist of the commentary and smaller versions of the other covers, like a page of thumbnail covers, quarter-page size covers, discarded concepts and pencil versions of the covers. The covers I like are mostly the not related to superheroes. The Invisibles and Jack of Fables covers are great because they are a bit quirky. And also those covers for short series. The commentary provided by Brian Bolland is interesting to read. He talks about the the conceptualization of the covers, and occasionally filled with stories of how he got to draw the covers. 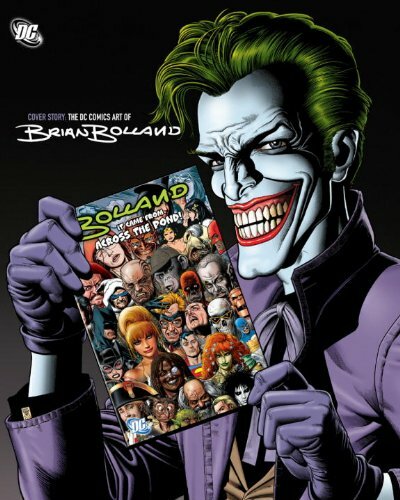 Overall a worthy book for all Brian Bolland fans. Been waiting for this review for a very long time. I might have to pick this up afterall. I was wondering if the John Romita Jr art book is worth getting? I remember you mentioned you recently picked it up. I'll be reviewing John Romita Jr art book in a few days time.